Fulton, NY – Participants in the Step By Step Wellness program are discovering the joy and power of music. Established by Peer Generalist, Derrick Hart, the programs new music therapy sessions have been a welcome addition to the programs and activities that the Step By Step Wellness program offers its participants. 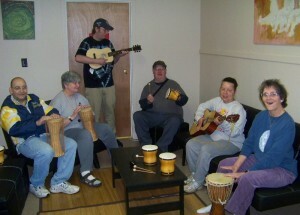 Derek Hart, standing, leads a music therapy session at the Step By Step Wellness program. A program of Catholic Charities of Oswego County, the Step By step Wellness program offers a variety of services to adults diagnosed with a mental illness. 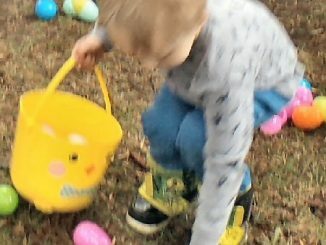 The program is located at Catholic Charities’ offices, 365 W. First St. in Fulton. Since joining the Step By Step Wellness program, Derrick, who himself is a musician, has been anxious to begin a music program. It is a program that he has built from scratch with Derrick contributing some instruments and leading the sessions. “Music is a very important part of my life. I enjoy sharing my love of music with others and seeing the smiles on their faces,” said Hart. The Step By Step Wellness program’s music therapy sessions include both structured and unstructured formats. Hart said that members have access to instruments at various other times as well. “We have received tremendously positive feedback from participants regarding our music therapy sessions. They enjoy coming together to make music and appreciate each other’s company and talents,” said Hart. According to Step By Step Wellness program Coordinator, Pam Peeling, the music therapy sessions are an excellent addition to the many presentations and workshops that the program offers. “The Step By Step Wellness program uses a wellness recovery model that provides an variety of services to adults diagnosed with a mental illness. Our wide array of services, which include; exercise classes, life enrichment classes, fun time, and now music therapy, are focused to support clients with their recovery, promote wellness, and combat the stigma of mental illness. These programs help individuals increase their self-esteem, establish group affiliations, and maintain independence in the community,” said Peeling. The Step By Step Wellness Program is available Monday, Wednesday and Friday from 9 a.m. to 3:30 p.m. and Tuesday and Thursday from 9:30 a.m. to 6:30 p.m.
For more information on the Step By Step Wellness program, or learn about becoming a participant, contact Peeling at 315-598-3980 ext. 251. As more people understand the power of music, how the vibration and words are steeped in our consciousness on the deepest levels, the world will change for the better. A collection of positive songs with positive lyrics is on this website http://www.happyrnb.com/. There, artists who create positive songs and instrumentals are listed with their notable songs. Music heals just like it can hurt; I used positive songs to turn around a depression that was caused by music with lyrics that created pessimism and sadness. Visit the site for great picks.